From the time my mom was given her diagnoses, her constant mantra was, “Please make sure you continue to tell our stories.” It was so very important to her that the stories of our family remain alive in our hearts and continue to be told and retold, even after she was no longer with us. During one of my vigils by my mom’s bedside, I assured her that I would indeed continue to tell her stories. I assured her I would not only share them with my girls, but with anyone and everyone who would listen. Because it is in our sharing of stories that I believe we truly get to know one another, and strengthen the bond that brings us all together in this great big world of ours. And to be honest with you, so many of my memories and stories seem to revolve around the sharing of food while sitting at a table with those we hold dear to us. I have loved sharing my family’s food stories in the past in this blog space, and it is my absolute pleasure to continue. 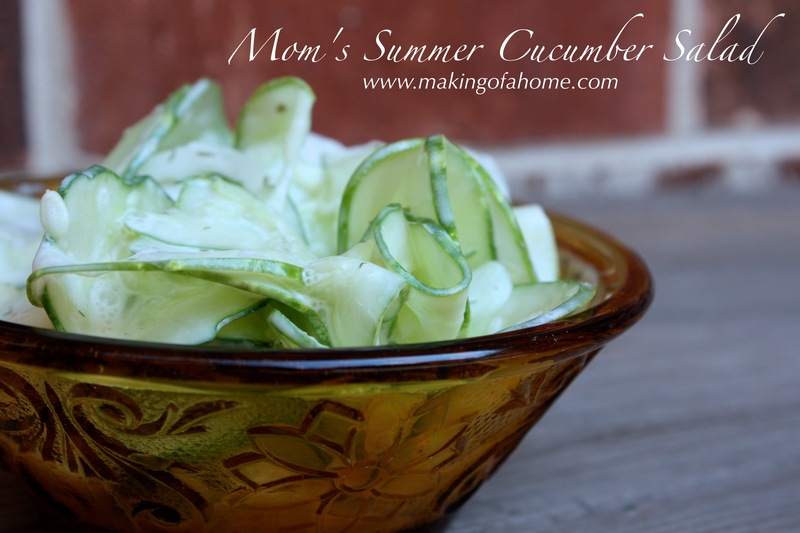 Today I am thrilled to share with you the story of my mom’s summer cucumber salad. While growing up, when the days seemed to stretch on forever, my sister and I felt compelled to stay outside all day long, riding bikes all over our neighborhood. It wasn’t until the sky began to turn rosey in the west that we would finally venture home, red-faced and exhausted. We would walk into the house, greeted by a cool blast from the air-conditioner, and find my mom setting the table in the kitchen. On these types of hot nights, instead of heating up the kitchen with lots of pots and pans on the stove and in the oven, my mom would always have a series of cool, fresh dishes waiting for us. 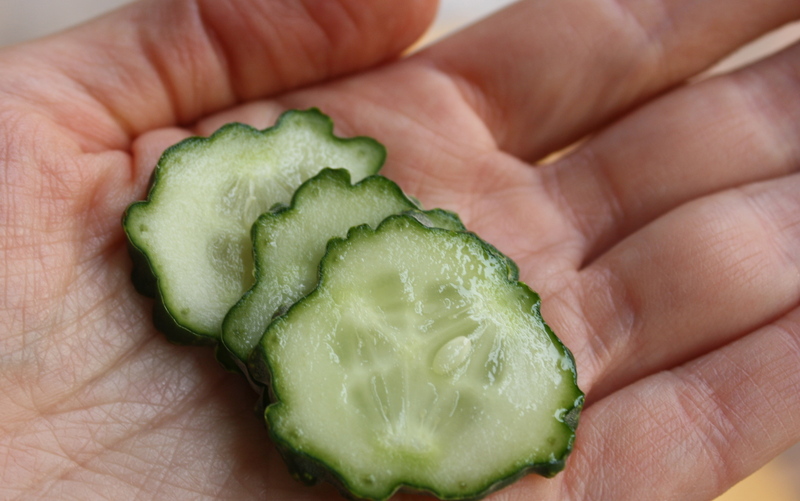 My very favorite of these dishes was my mom’s cucumber salad. It was always so cool and creamy, yet tangy and fresh. It just tastes like summer. Whisk together the sour cream, apple cider vinegar, dill weed, salt and pepper. Thinly slice the cucumbers and onions. 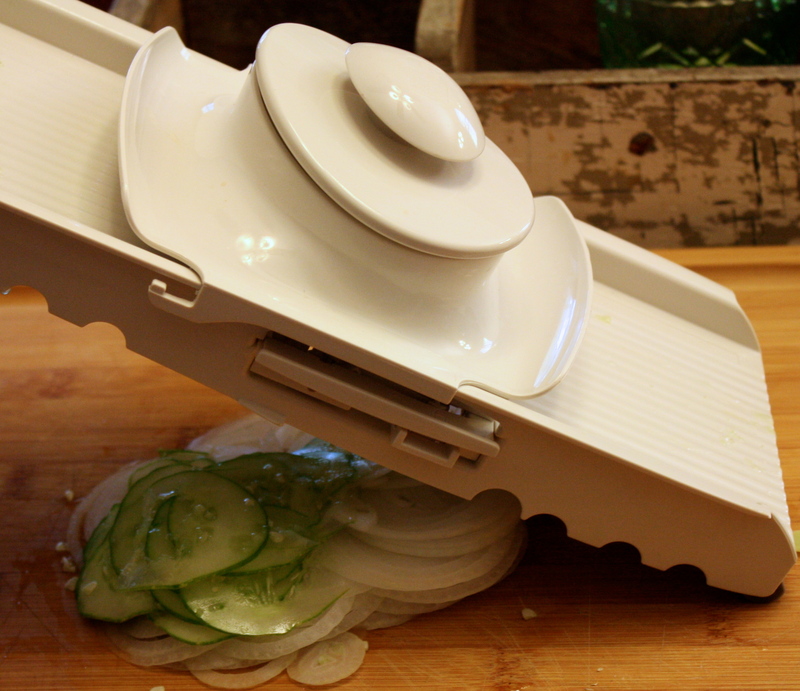 (I use a mandoline to accomplish this task because it leaves you with thin, consistently-cut produce.) Pour the sour cream/vinegar mixture over the cucumbers and onions. Mix until combined. Refrigerate until ready to serve. Enjoy! This entry was posted in Holistic Living, Recipe, Sustainable Living and tagged backyard, cooking, cucumber, cucumber salad, DIY, eco friendly, farmer, farmer's market, food, fresh, garden, gardening, gardens, growing, harvest, holistic, holistic living, home, homemade, homemaker, homemaking, make, making, mindfulness, mom, mother, organic, Pampered Chef, recipe, sustainable, sustainable living, The Pampered Chef, The Pampered Chef Ultimate Mandoline, Ultimate Mandoline. Bookmark the permalink.